Day nine. 9.30am. The Housemates decide to have an extra hour in bed so are having breakfast. 10.30am. Housemate Marie is busy tiling while Housemate John is working on the Belfast sink unit. 12pm. 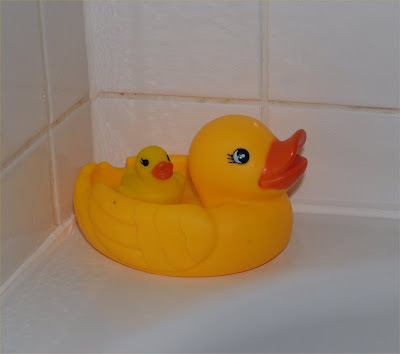 Housemate Marie asks if electric sockets are really necessary as she is having real problems tiling round them. Housemate John replies yes. 1.30pm. Housemate John is finishing fastening the Belfast sink unit to the wall. He is a little perplexed as the installation manual appears to have the sink lower down than is required. 6.30pm. The Housemate pack up for the night. Day 8. 9.30am. The Housemates are nowhere to be seen. They have left the House to pay the newspapers, get the lottery, buy some sandwiches from the Deli and get some things from the DIY store. 10.30am. The Housemates start work building more base units. 1pm. Housemate John finishes off building the final two base units while Housemate Marie makes a start on the tiling. Things are not going very well for Housemate Marie. She is making a very slow progress with the tiling due to there being a double electric socket to tile around on the very first row of tiles. 2.45pm. Housemate Marie has only managed to put on two rows of tiles. She is not a happy bunny. 4.30pm. Housemate John finishes attaching the base units to the walls. He now makes a start on attaching the workbench upstands. 6.pm. Housemate Marie has now completed eight rows of tiles so she is feeling a little more cheerful. The Housemates decide to call it a night. Housemate Marie was though able to help Housemate John construct the Belfast sink unit. The Housemates have had to redesign the unit as they wanted a Belfast sink but Wicks didn’t do a Belfast sink unit in the range they chose. 1.30pm. Housemate John cleans the tiles as the grout has now dried. 3pm. The Housemates set to work attaching the corner base unit and the pulley-out cabinet base unit together and to the wall. 4pm. Housemate John starts work on the plumbing for the Belfast sink. He makes lots of noise and mess as he has to drill right though the kitchen wall to the yarden. 6.pm. The Housemates call it a night as they have to go shopping for food supplies at Morrisons then get the Chinese take-a-way. Day 6. 9.30am. Housemate John starts undercoating the ceiling edging the Housemates put up yesterday, while Housemate Marie heads off to pick up some tiles they had ordered. Once the undercoat is dry Housemate John puts a coat of paint on the ceiling edge, while Housemate Marie paints the skirting boards. 2pm. Housemate Marie is very excited as the Housemates are ready to start tiling above the wall units and she gets to play with her new toy – an electric tile cutter. Once the tiling is completed, the Housemates make a start on building the base units. 6.20pm. The Housemates finish for the night and look forward to a pizza and garlic bread. Day 5. 9.30am. This morning the Housemates are feeling much better following their yummy morale boosting meal last night. They get to work on the remaining wall units. 2pm. The Housemates finish putting up the last wall unit. 4.pm. After a trip to Wicks for Housemate John (Housemate Marie had to remain in the House as Housemate John was expecting a couple of parcels to be delivered today for the Birthday bunny), the Housemates make a start putting up the ceiling edging. 6.45pm. The Housemates put the last bit of ceiling edging then finish for the night. Day 4. 9.30am. The Housemates continue building the wall units. 2pm. The Housemates start putting up the extractor fan. 3.15pm. Housemate John notices that the wall units haven’t ended where they should. He does some measuring and they are out by 10mm. He can’t figure out why then it suddenly hits him. The corner unit has to be moved out from the wall by 10mm. All the wall units that they have put up have to be moved 10mm. We apologise for the use of bad language from Housemate John. 4.45pm. The Housemates have successfully moved the wall units by 10mm. Housemate Marie then says she thinks that the extractor fan isn’t in the right position. Housemate John checked the fitting instructions and confirms to Housemate Marie that it is indeed in the right position. Housemate Marie still isn’t convinced and get out the plans drawn up by Wicks. Housemate Marie shows the plans to Housemate John and it show a different fitting position to that on the instructions. The Housemates have a discussion and decide to follow the original plans so the extractor fan is removed and repositioned. 5.54pm. The Housemates are a little deflated with their progress on day four so decided to go out for a morale boosting meal. Day three. 9.30am. Housemate John is still stiff and a little painful this morning. The medicinal last night helped so did a rub on his aching back with deep heat just before the Housemates retired for the evening. Housemate John set to work seeing to some plumbing while Housemate Marie did some more filling of holes. Housemate Marie lost her temper when the bits she was trying to fill the holes with kept falling out. As it is before the nine o’clock watershed we do apologise for the use of bad language. 2pm. The Housemates make a start putting up the wall units. 6.10pm. The Housemates down tools and finish for the night having successfully put up four wall units. Day 2 9.30am. The Housemates are feeling a little stiff and painful. Housemate John tries to jolly up Housemate Marie by getting her to chant ‘dishwasher, dishwasher’ over and over again. Housemate John finishes off removing the tiles that Housemate Marie couldn’t reach yesterday. Housemate Marie starts filling in holes in the walls that the tiles have made when they were removed, while Housemate John starts removing the cladding from the wall. 2pm. Housemate John makes lots of noise and mess with his wizbang drill. Housemate Marie is surplus to requirements but keeps Housemate John company in the kitchen. 6pm. The Housemates pack up for the night. Housemate John is very stiff and aching so Housemate Marie recommends that this evening he has a drop or two of medicinal. 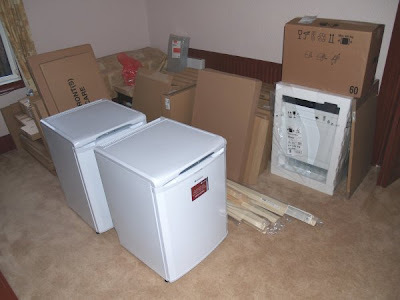 In a Geordie male voice “Welcome to a brand new series of the BOFOF household… …fits a new kitchen. It’s day one 9.30am and the Housemates get to work dismantling the old kitchen. The old freezer has been put in the yarden and the dresser dragged into the hall way. The Housemates then rip up the old carpet. 10am. The Housemates have already made a start removing the cupboard doors and units. The workbenches are removed and Housemate Marie tries her hand for the very first time at sawing wood – or rather workbench. After lunch Housemate John sets to work removing the kitchen radiator. Housemate Marie, with her hammer and chisel, starts removing the tiles. Housemate John, having removed the radiator, then sees to the pluming for the new kitchen towel rail. Housemate Marie is still plodding on removing the tiles. 6pm. Housemate John has fitted the towel rail and is now switching the water back on. Housemate Marie checks for any water leaks. …. till we start ripping out the old kitchen and installing the new one. We’ve done some workings out and we think it should take us about seven days to do it. This morning I picked up the new tiles. Thankfully the new shed has come in useful so they’re living there for the time being. As we’ll be without the AGA during the installation we have to make do with the microwave and the slow cooker so I’ve started batch cooking some meals ready to pop in the microwave. I’ve finished my first novel ! ! ! It’s been a long time in the writing but the first draft is finally done. I’m going to give myself a break then I’ll start work on draft number two. Yep we’re still here. I’m afraid there hasn’t been any thing to report in the BOGOF household, hence the lack of blogs. Yes, Mr and Mrs Seagull have decide to once again build a nest on the same chimney pot as last year. Again like last year there’s three chicks. However they are a little camera shy at the moment so we haven’t been able to get a photograph of them. Once they have overcome their shyness we’ll put a picture on the blog of the new arrivals. In other news, it’s only 10 weeks till we start ripping out the old kitchen and fitting the new one, 11 weeks should see the dishwasher installed (I can’t tell you how excited I am at that – yes I know I’m sad ! ! ! ), 12 weeks and two days till I hit the big 40 and 12 weeks and six days till the party. Yes folks, we’re back. There’s been a bit of a break in blogging for a couple of reasons. First, we bought a block of time on the ship and needed to keep some of it back so we could check in our return flights on-line and second, we both came down with attacks of coughing and suchlike after some sudden hot and cold weather changes on the last day and we’re just about back to normal now. 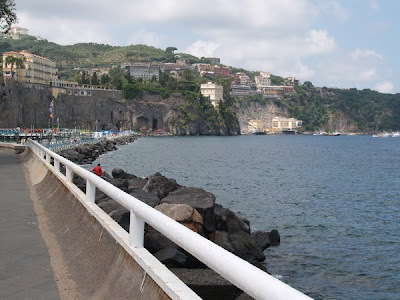 Sorrento was our last port of call. 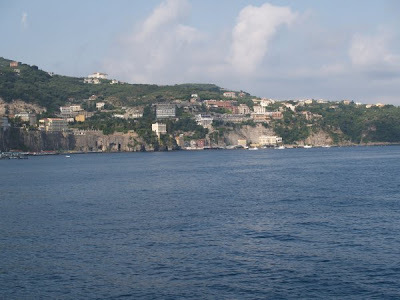 We anchored in the bay of Naples and here is the final Veranda View of the holiday (I don’t count the last one as we were in some industrial docks). We took the tender ashore and this was the general view. The minibus ride up to town was a bit hair raising in the narrow streets. Back down at the port waiting for the tender we found this little fellow and some of his friends. 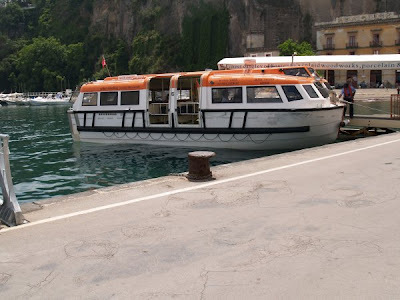 Speaking of tenders, this is one in Sorrento, and here is the other one on the way back to the ship. It was nice and calm during the morning but by afternoon it got quite rough, with 30 mph winds. 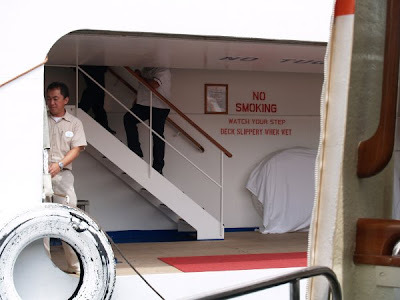 At one point they had to turn the ship to give the tender some shelter as it came alongside. This is the small hole in the ship’s side you have to aim at. So there we are. We left the ship at 9:30 and were home twelve hours later, despite BA’s best efforts to delay us in Rome. And our luggage made it home too. Amazing. We’ll get a full picture gallery up when we’ve had a chance to sort them out. 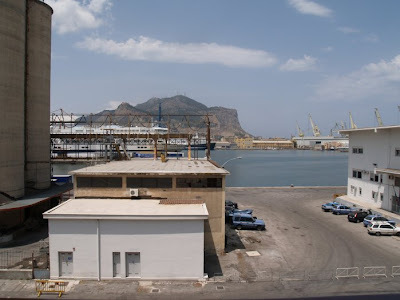 So where are we today –oh yes, Palermo. Today’s veranda view isn’t great but you can’t have a wonderful view every day. On the other side of the ship is a huge cruise liner. Ours has a max capacity of 383. We think this one has a capacity of about 2000. It towers over us. And on the other side of that ship is an even bigger one. 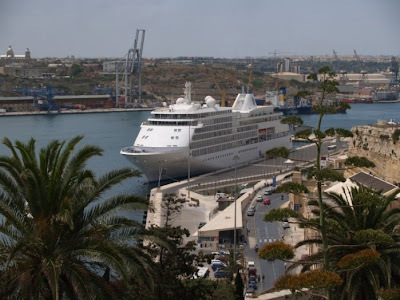 Now with three cruise ships arriving at the same time, you can imagine what the local traders thought. To go ashore you had to run the gauntlet of taxi drivers, horse drawn cab drivers and people selling just about every kind of tourist tat you can imagine. Then we tried to make our way into town. If you thought northern Italy (Milan, Florence and Rome) were busy, that’s nothing compared to Palermo. Manic is the work most people are using to describe the traffic, the crowds and the heat. We made it into town, then came right back and sat by the pool to recover. 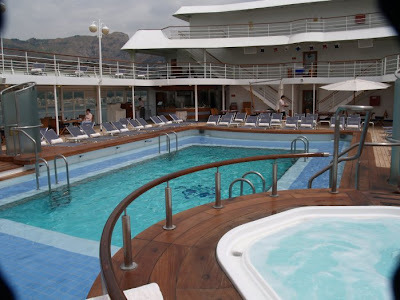 Thought you might like a look round the pool deck. These pictures were taken early yesterday morning when it was quiet. 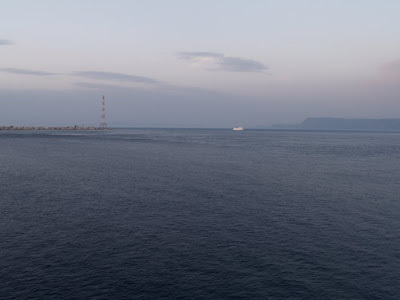 Last night we passesd through the straits of Messina, between Sicily and the Italian mainland. 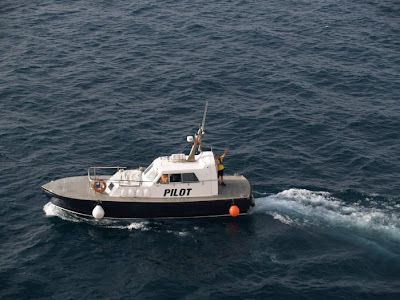 At their narrowest the channel is about two miles wide and you have to take a pilot on board. It was 8 pm and the sun was setting, so sorry about the quality of the pictures. And finally, for those who like such things, here’s a picture looking down on the bridge wing from above. The man is letting rip with the ships horn (which is VERY LOUD). 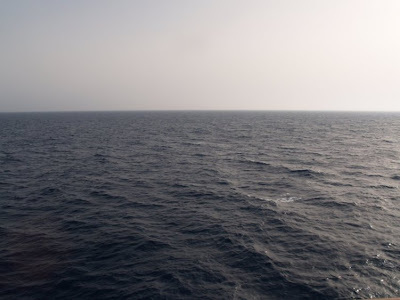 Well, here we are, half way through the cruise so what can we say. 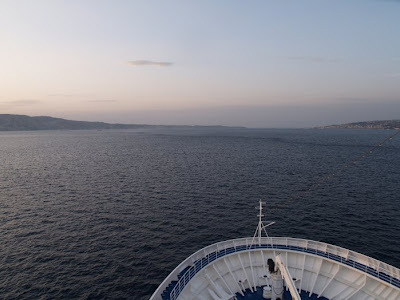 Before we go into detail, we’re anchored in Naxos Bay, just a few miles from Taormina in Sicily. 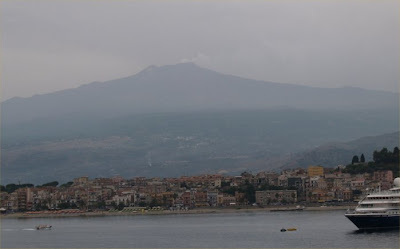 Here’s today’s veranda view, with Mt Etna in the background. Yes – it really is smoking. The average age is lower this time, in fact it seems to be getting lower all the time. Also, there are more “normal” people. There are still the super-rich, but not so many as there used to be. As a result, people are less likely to be snobbish and more likely to speak. Possibly as a result of this the staff are even more friendly than before (if this is possible). The mix of nationalities is also more pronounced, with people from India, Argentina, Germany and Belgium as well as the British, Americans and Australians. 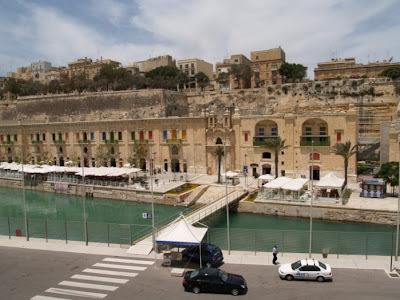 The weather hasn’t been too hot, though it did reach 80 for a time in Malta yesterday. Today it was 72 F at 8 am but hasn’t changed much since then. Fine by us but no doubt some will complain. 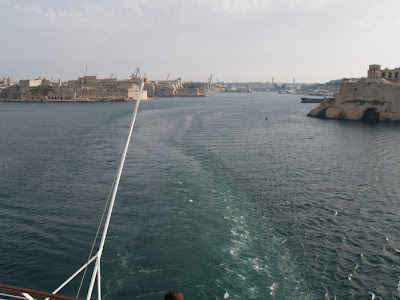 As we said yesterday we were about to leave the Grand Harbour in Malta, and here are some of the pictures. Here is the pilot wishing us bon voyage. And finally, here’s our mystery man. We’re all trying to figure out if it really is Jeremy Clarkson. He looks a bit older, but then he’s not in his TV makeup, and he has all the mannerisms. He’s not listed in the guest list, but you can ask to be excluded. 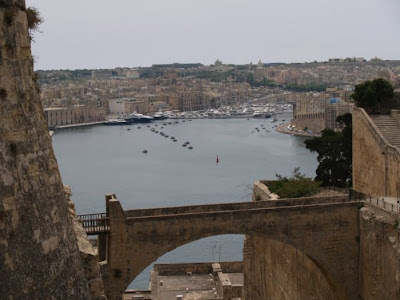 A late blog today because we’ve been busy exploring Malta. More of that in a moment, but first, yesterday we did something neither of us has ever done before. We saw Africa. OK, it was only the coast of Tunisia on the horizon, but Africa is Africa. 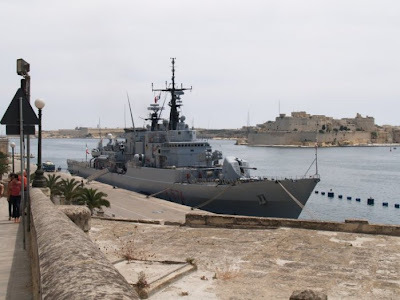 And this is our next door neighbour, from the Portuguese navy. 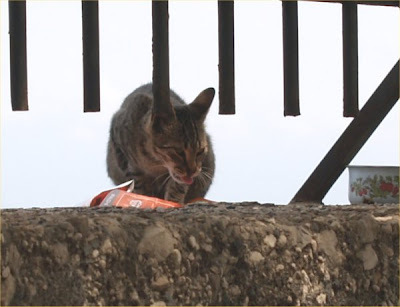 … together with one of the locals. 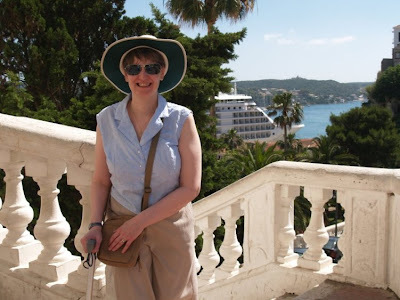 And finally, here’s Marie enjoying the view of Valetta from the Veranda. Must dash as we’re about to leave port and we want to watch. Hello, we’re back with more adventures of the BOGOF household on holiday. 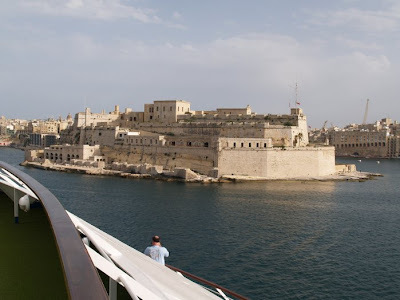 We left Mahon at 6pm yesterday and should arrive in Valetta at 8 am tomorrow. For those of you with GPS our current position is 37:50:28 N, 8:51:51 E. For those without, we’re midway between the south coast of Sardinia and the coast of Tunisia. This is the view from our Veranda this morning. I think the view of Mahon from the ship has to be one of the best on the island. This is the view from the pool deck. Just to prove that we did walk all the way up, here is Marie at the top. And here is a view of the ship, the Silver Whisper, also from the top. 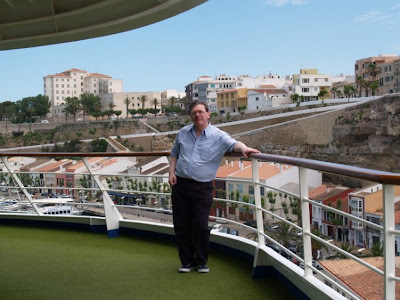 And this is me, as taken by Marie, before we left Mahon. After breakfast yesterday we spent time blogging, then we went into town. We returned to have lunch, then lazed around by the pool until afternoon tea. After that we got ready for the Captains cocktail reception, followed by dinner then on to the theatre for a show. If you are thinking that life revolves around food you would be right. You can have coffee and Danish pastries from 6:30 in the observation lounge (this is above the bridge and has large glass windows and a GPS display) then breakfast is 7:30 to 10:00. 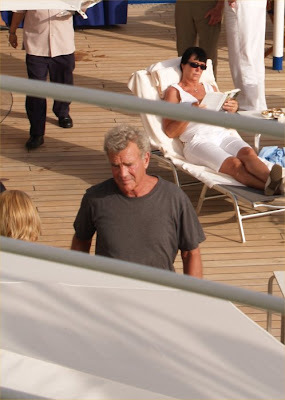 At 11:00 they serve boullion and crackers in the panorama (this is at the rear of the ship. In the evenings it becomes a cocktail lounge where Henry plays the piano). At 11:30 they open the poolside grill. Then lunch is at 12:00. Today it’s a galley lunch so we get to go right inside and meet the chefs. 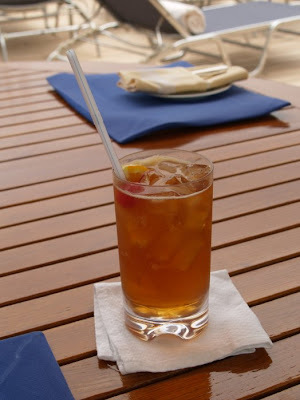 Afternoon tea isn’t until 4:00 pm, but you can always go back to the poolside grill (and bar) until dinner which is served between 7:30 and 9:30. It’s great that you can just turn up without a reservation, and either eat alone, or take a chance and sit with someone you’ve never met. Yes, we’re here, and so is our luggage – Result. So what’s happened since we set off. The flight to Heathrow was quiet. We sat behind Alan Shearer who was on his way to do his football pundit bit for the BBC at Wembley. We didn’t eat chicken at the hotel. But we found some familiar faces in the bathroom. Heathrow security was a revelation. At Newcastle we had to take off our shoes and belts, and the computer out of its case. At Heathrow there were none of these. Either they’re very lax, or their scanners are much much more sophisticated than those at Newcastle. Hopefully the latter. 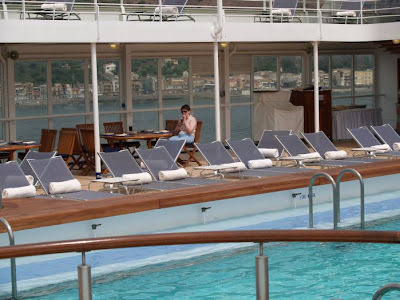 The journey to Barcelona was uneventful and we boarded the ship at 3 pm. This was the view looking back from our veranda. Dinner was it’s usual best, and before that we attended the welcome party on the pool deck where we drank way too much Pimms. 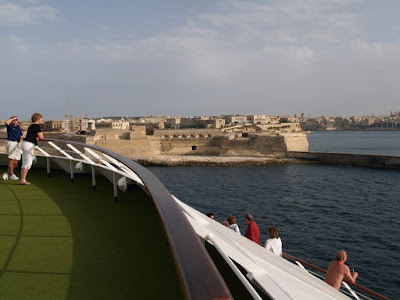 As we left our berth the ships band (well, a quartet actually) struck up “Anchors Aweigh”. Then they played “Y Viva Espana”. All the British laughed at the irony, and the Americans couldn’t understand why. We’re currently in Mahon and about to go ashore. This is the view from our Veranda. By the time you read this, we'll hopefully be on our way. Tonight will be spent at Heathrow staying at the same hotel as the famous "chicken conference". Tomorrow we'll fly out to Barcelona, where we'll hopefully be reunited with our luggage which we will entrust to the tender mercy of British Airways at Newcastle airport this morning. We're flying in to terminal five so there's some cause for concern. The Barcelona flight leaves from terminal one so who knows where the luggage might end up. 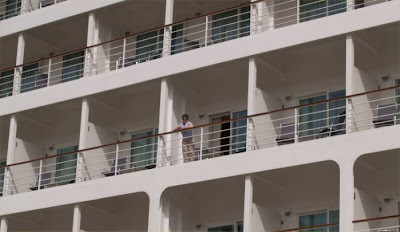 From there on it's a life on the ocean wave for the Bogof household. The ship has wi-fi so we've decided to be geeky and take the laptop. 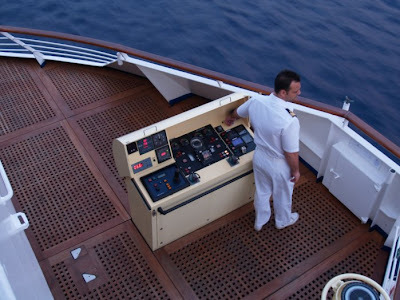 This way we can blog with pictures during the cruise. Will the luggage turn up. Will we have stuff confiscated at security. Will the flight be delayed. Will we get chicken to eat at the hotel tonight. We spent this afternoon packing and given what happened last time* we’re taking no chances so have packed extra clothes into our hand luggage. John weighed the cases and I’m getting a little concerned as they’re not that heavy. What have we forgotten ! ! ! *we arrived in Barcelona but our suitcases didn’t. Thankfully they arrived the next day. 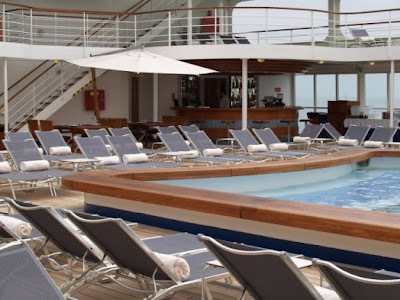 As you know we’re off on our cruise shortly – one week and five days ! ! ! 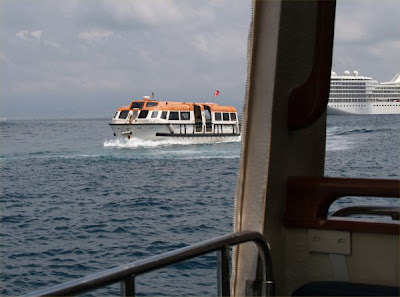 The travel company were cheaper than Silversea but we have had nothing but hassle with them. So much so that the Customer from Hell had to make an appearance and told them that if the problem wasn’t resolved, I would be taking the matter up with ABTA. It was sorted within 24 hours. 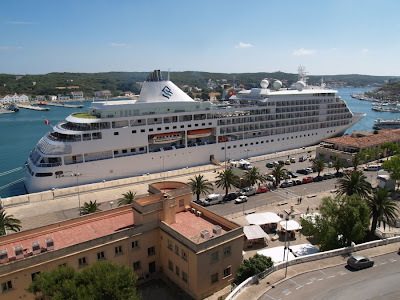 As we had completely lost all faith and trust in the travel company we requested that all correspondence, including our tickets, be sent direct to us from Silversea and not the company. They assured us this would happen. On Wednesday our tickets arrived and guess where they had come from, - the travel company. We were not amused…. Yesterday a special delivery parcel arrived direct from Silversea - with our tickets ! ! ! We now have two lots of airline tickets, cruise tickets, even Silversea leather luggage labels. Sadly though they’re identical and not for another cruise. Given the incompetence of the travel company that wouldn’t have come as no surprise…. 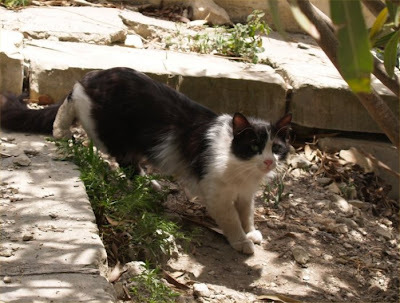 Yes – we’re back from our wandering. Since Saturday we’ve covered over 800 miles to look at three venues, two of which are possibles for spring conference. Saturday saw us heading off to Swindon to look at the Hilton. This has the “wow” when you walk in, and is in a great location, about 200 yards from the M4. 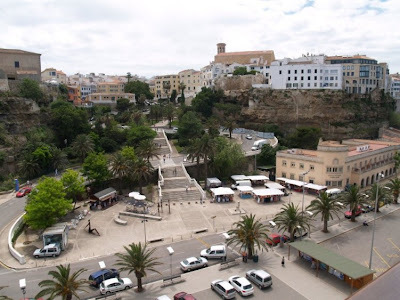 It has overspill hotels nearby, and also some shopping. The price is excellent and there are no single room supplements. On the down side, you have to pay £22.50 for a bottle of wine (though we may find a way to ease the pain) and some of the conference rooms are a bit of a tight squeeze. Sunday was The Ramada in Maidstone. A totally different kind of hotel, set in 20 acres of parkland with a lake and tennis courts. Inside it doesn’t have the wow of the Hilton, and looks a little tired in places though the bedrooms are new and of a very high standard. The conference facilities are great but will cost more than Swindon A bottle of wine only costs £14, but the location isn’t as good. It’s close to the M20 but there’s nothing around. No shops and no overspill hotels. So now we have a dilemma. Swindon or Maidstone. And next week we’re off to Glasgow to see two more. On Friday my mam and I when shopping to the Metro Centre. I needed a couple of things for our cruise (four weeks and three days…) and also some new bras. I know M&S sometimes gets a bad press when it comes to measuring for bras but I’ve always found them to ok. While I was waiting my turn to be measured (they were busy) we had a look at the various non wired bras (can’t stand wired…) and I found some styles that I liked and that came in the size that I was expecting to be, given that I had lost 12 lbs in weight. ‘Pauline’ shouted out my name and the first thing she said was ‘I’ve had you before and if I remember, I had problems finding you a bra….’ She was right. See ‘What no blog - March 11 2006’. She took the first measurement. Pauline: What were you previously. Pauline: You’re still a 34. She took the second measurement. Pauline: You’re in-between a cup size. Me: Excellent so I’m back to a 34D. Pauline: No, you’re in-between a 34E and a 34F. Me: But I’ve lost 12 lbs ! ! ! I was 34DD before I went on a diet. As the bra’s I’d been looking at earlier didn’t come in industrial strength sizes, I had to go to the bullet proof, passion killer range. I think Pauline must have felt sorry for me as she came back with the least offensive ones they had, which to be fair, were rather nice. I don’t know what it is with our neighbours but for some reason they seem to like both our wheelie bin and our recycle black box. Our brand new recycle box got swiped two weeks after we got a replacement for the one that was stolen. We didn’t dare phone the council to ask for another replacement in case they thought we were stock piling them. So for several weeks we just used an old wine box then gave a new home to an abandoned battered box that had been left unused and unwanted in the back lane for several weeks. This morning when I went to go to my mams I found that our bin had been swiped. I can understand people taking in the wrong bin by mistake as they all look alike, but ours had our address on the front and back painted in large letters and numbers. Come bin out night next Thursday we’ll be kidnapping it back ! ! ! The problem with the BOGOF household is we’re really rubbish at keeping a diary. Plus there hasn’t been anything exciting to report. I’ve been spending most of my time making shirts for our cruise – 5 weeks and counting ! ! ! Last Friday while I was at my mam’s I had to borrow her new sewing machine (the one we bought her for Christmas) to sew the button holes as my machine is having a temper tantrum and won’t let me stitch them. My mam then decided she liked one of shirts and asked if I could make her one as I had some spare fabric. Four shirts done, only two more to make. Last weekend we were in Scunthorpe for a conference team meeting. In the next couple of weeks we’re off on our travels again (and I don’t mean on our cruise. Did I tell you it was 5 weeks and counting…) This coming bank holiday weekend we’re off to Swindon and then Maidstone to have a look at two hotels for spring 2010 conference. Then the weekend after that we’re up in Glasgow to look at two hotels for spring 2011. While I was on the BA website this morning filling in the required passenger information report for our cruise, I checked our flight details and we’ll be using the dreaded terminal 5 ! ! ! Thankfully it’s only to and from Newcastle and from Rome. Our Barcelona flight is from terminal 1. My third ‘sorry’ was to the two bus spotters* in the Cliff Pub. As I mentioned Thursday I like my coke really cold so get a separate glass of ice to pour the coke over the ice. One Saturday night when we were in the Cliff, my glass of ice had quite a bit of water in it. As I didn’t want to dilute my coke I needed somewhere to get rid of the excess water. One of the bus spotters finished his pint then said to the other one, who had about a third of a pint left, “are you ready”. The other one nodded and they both left the lounge. So I went over to the table were the bus spotters had been sitting and poured the excess ice water into the glass which had the lager in it. About five minutes later they returned ! ! ! * they were two men who talked of nothing but buses all night. Ask Chris as he’s been in the Cliff when they were there - and experienced them in bus spotting mode ! ! ! My second ‘sorry’ was to two members of Radio Sunderland for leaving an empty bottle of Champagne outside of their room at the Plymouth hospital radio conference. John had been given a bottle of fizzy for his 40th birthday and up until that time hadn’t had a chance to drink it. Plymouth is quite a distance away from Sunderland so we decided to break the journey by staying a couple of nights each side of the conference in Stratford upon Avon. As it was our first ‘dirty weekend’ away together we thought it would be an ideal time to drink the fizzy so took the bottle with us to Stratford. We couldn’t find anywhere to dispose of the empty bottle so had no option but to take it with us to Plymouth. I like to drink my coke extremely cold so whenever we were out anywhere I would always ask for a separate glass of ice so I could pour the coke onto the ice. Not only did we have a fizzy bottle to get rid of but a wine bucket as well. No problem. We decided to put it outside the room of the two females members from Radio Sunderland who luck would have it had the room opposite us. We had arranged to all meet up for breakfast so they were coming out of their room at the same time as us, so too was another member from Radio Sunderland who had his room just along the corridor. He took one look at the fizzy bottle and bucket and demanded to know what they had been up to that night. A couple of years ago Ken Bruce on his Radio 2 programme had a slot called ‘sorry’ where people wrote in and ask for forgiveness for something they had done. I had three ‘sorry’s’ read out. Here’s the first one. It was to say sorry to the owner of Castle Howard as I had vomited all over his marble floor. Before anyone says anything I wasn’t suffering from a hangover ! ! ! I’d just had bought my first car so my mam, dad and me decided to go away for a couple of days to Scarborough. On our last night there mam thought it would be a good idea if we got some fish and chips and ate them over looking the beach. Unfortunately both me and my dad ended up with food poisoning from the take-away so we were not feeling in the best of health the next morning. My mam decided that a visit to Castle Howard on our way home would take our minds off feeling ill. We must have only been in the building ten minutes when I really didn’t feel well at all. I explained this to my mam and her reply was ‘of course you’re not feeling sick…’. I pleaded with her that I really wasn’t feeling very well so reluctantly she found a guide and said to her, ‘my daughter is feeling… no make that, my daughter has been sick’. Yep, I was re-enacting the scene from the Exorcist all over the marble floor and became a tourist attraction as visitors stopped and watched ! ! ! We were quickly taken to a private loo where I could continued my throwing up. Really - fancy that :-) Diane really enjoying it - food v good. And June ok too ! Cu soon. Dx. Sadly there hasn’t been any blogs for several days as we’ve been pretty busy with Leeds conference. As expected we were working most of Easter. We did manage to get a couple of hours break from conference on the Saturday. My car had to go into the garage to get its brakes checked out as they’ve been feeling really heavy. They could find nothing wrong with them. I’m not convinced. Then it was off to my mams so John could replace her kitchen tap. I’m afraid the diet has gone out of the window. We ate all the chocolate that had been stashed away from Christmas, plus with it being a bank holiday, we always have food that is normally banned (bacon sandwiches, curry with nan bread, spag bol with garlic bread, sausages and chips). Hopefully we won’t have put on too many pounds as John was only three away from his first treat and me, I was only ½ pound ! ! ! Apologies for the lack if blogging (bloggage ? bloggery ?) this past week. I’m afraid that it’s all the fault of conference and the calendar. If we’re to have any time to ourselves over Easter we must get stuff sorted now. As I write this the printer by my side is turning out conference brochures and Marie is grappling with the table plan for the Gala Dinner. On the bench are menus, place cards, badges, general meeting minutes and goodness knows what. And we’ve had to answer a sudden rush of e-mails too. The good news is that it’s looking like we’ll get done and still have time for chocolate at Easter. Must away now to put some badges in their holders. First of all the important bit. Marie’s mouth is much better and she’s back on solid food. Other than that it’s been a week of getting conference sorted. We had our final meeting with the Queens (Hotel) two weeks ago and had out meeting with the rest of the team last week-end. Bookings have gone as well as you might expect, and we’ve had to turn people away because we’ve run out of rooms. Seminars have been finalised and trips & visits are almost there. Menu’s are sorted and ready to be printed. So too are place cards and badges. The brochure is almost complete, as is the booking form for Solihull. I think the latter may surprise a few people. There’s lots of nice things for conference packs hidden in the bottom of the wardrobe. The Dining room is full of folders and notepads. What a couple of days I’ve had with my tooth ! ! ! I knew abscesses could be painful but I never expected anything like what I’ve just had. Thursday night sleep was about three hours. Friday nights Chinese consisted of rice, four bits of lemon chicken and three prawns, all cut up into tiny bits. Again only about two hours sleep that night. On Saturday we had to be up at 5.30am to be in Leicester for a conference team meeting. The original plan was to stay the night at the hotel, however having paced the floor that night because of the pain, I thought it best if we just came home. By now my mouth and gums had swollen quite nicely so I resembled Quasimodo’s sister. Saturday night was the worst. Having worked out when I could next take some painkillers, I took some at 12.30am. Half an hour later and I was still in agony. An hour later, still nothing. At 2.30am I was crying on the shoulder of John as the pain was unbearable. I now know why people accidentally overdose on painkillers as I would have willingly swallowed the whole packet if it mean getting some pain relief. I decamped downstairs as I didn't want to disturb John by tossing and turning the rest of the night. Sunday was pretty much the same as Saturday in that I was counting down the minutes to when I could take some painkillers. I went to bed expecting it to be another bad night but other than having to take some tablets at 2am, I slept right through until 6.30am. I was to have phoned the dentist this morning to see if I could get an emergency appointment to see Kim, but as the swelling in my face had gone down and the pain was now a dull throbbing, which was manageable without painkillers, I didn't bother. I did have to take some painkillers this afternoon as it flared up again but so far that's been it.